How to apply: Applicants can register themselves for admission to M.B.A. (Full-Time) and Ph.D. Programmes through FMS website www.fms.edu by filling up online registration forms and by paying the requisite fee of Rs.750/- (Rs.200/-for SC/ST/Physically Challenged category) for each programme, during September 21, 2011 to November 30, 2011. Admission to M.B.A. (Full-Time) and Ph.D. Programmes will be based on personal interview, group discussion and CAT-2011 score (Common Admission Test conducted by Indian Institutes of Management during October 22, 2011 to November 18. 2011). 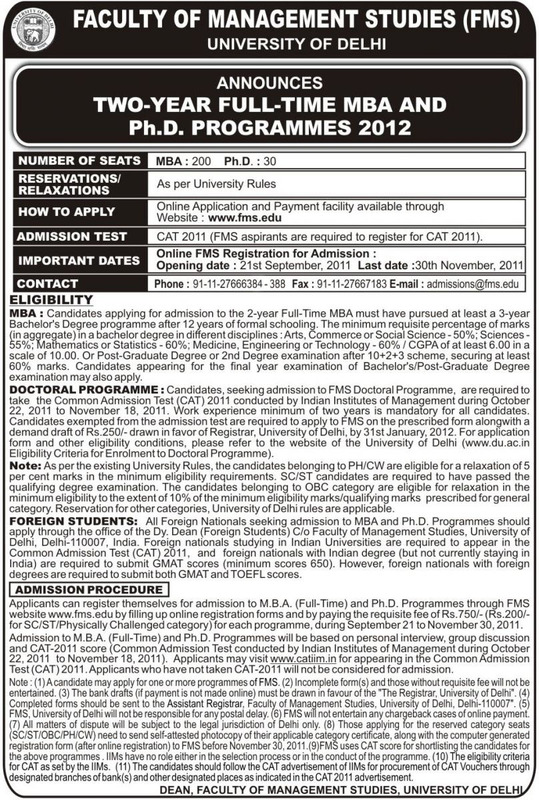 Applicants may visit www.catiim.in for appearing in the Common Admission Test (CAT) 2011.